while the 240mm Noflexar and the 500mm Tele-Noflexar “lens heads” are on the left. The lens cap shown is for the 500mm Tele-Noflexar. The lens head has the full optical section in its barrel, together with the aperture and aperture control ring, the lens hood (if provided) and the lens cap. The front element of the 240mm Noflexar is so deeply recessed within the mount that no further lens hood or shade is required with this lens. 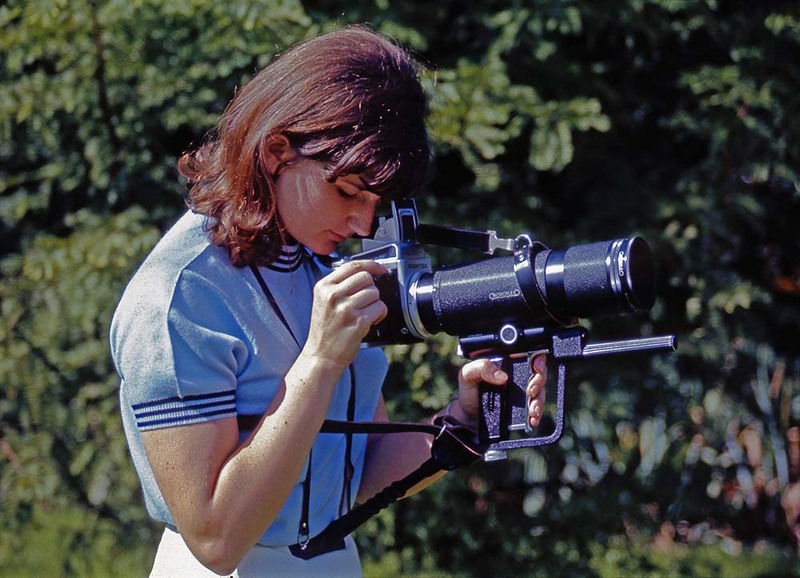 The pistol grip provides the focussing mechanism and has on the back the appropriate camera mount. 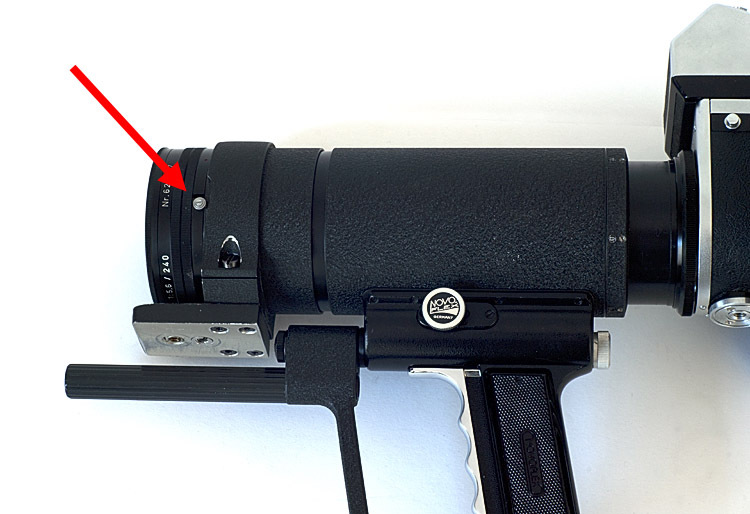 The grip with the Pentacon Six mount has the manufacturer’s code name “TISPIGRIFF”. and then rotating the lens head anti-clockwise about 1/6 of a turn to remove it from the bayonet mount inside the pistol grip. When one removes the lens head from the pistol grip for the first time, one may have a surprise. On the rear end of each lens head there is a male filter thread that will accept a 49mm filter. 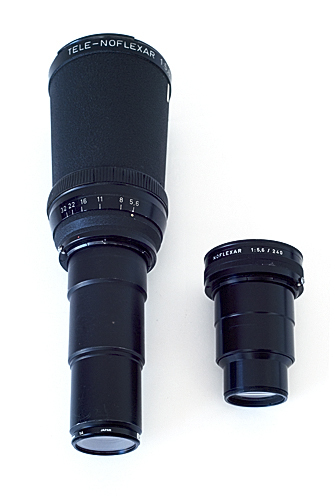 In the photograph on the left there is a UV filter mounted on the back of the 500mm Tele-Noflexar. No filter is necessary for the correct optical operation of either lens. I do not know if these lenses permit infinity focus when used on the Novoflex bellows. 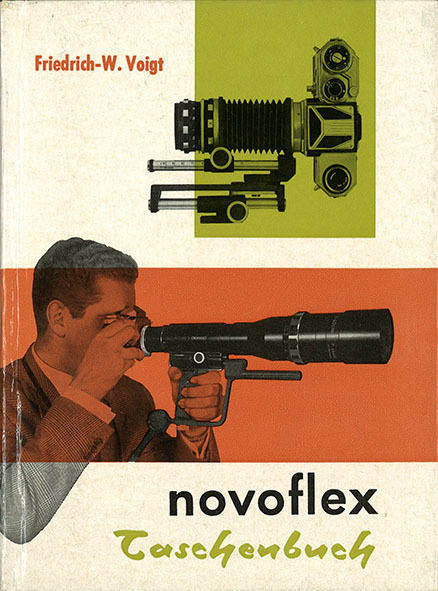 See the section on the Novoflex bellows here – but it does not include pictures of the Novoflex bellows lenses. 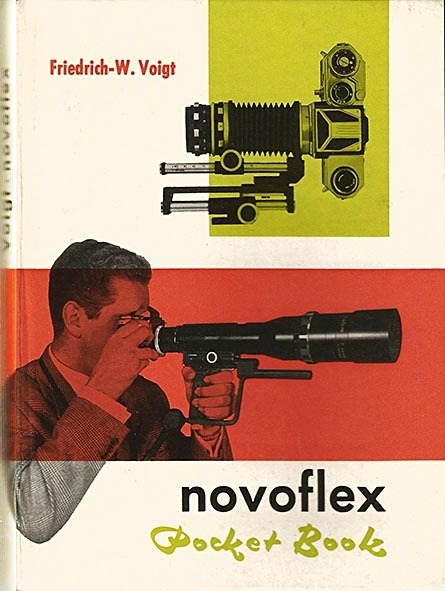 Novoflex made a point of stating that these lenses were indeed designed to be used at maximum aperture. Obviously, if you are shooting at maximum aperture, then you only have two things to do, and operation is easy and fast. 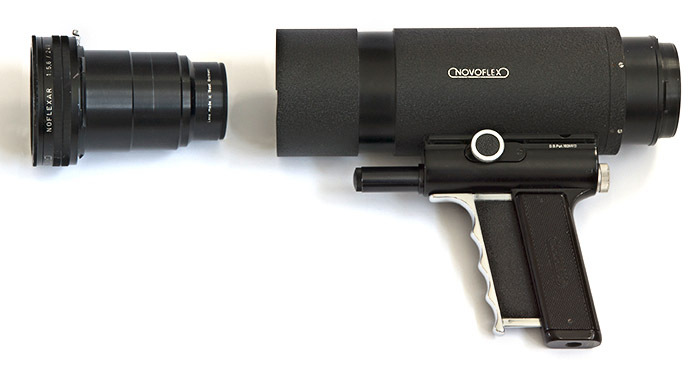 In fact, focussing with the pistol grip is much faster and easier than with the rotating focussing helical grip that is found on most lenses, and can be continuously varied as required when tracking a moving object such as a bird or other wild life – or even a footballer or players in other sports. My measurement shows the minimum focus with this head and the standard rifle stock as 2895mm (approx 9½ ft), measured from the focal plane of the Pentacon Six. This is reasonably similar to the distance quoted by Gillespie, which probably comes from Novoflex literature. However, it is necessary to remember that, in consequence of the different thicknesses of the camera mounts used, Novoflex lenses may focus "beyond" infinity. This is not a problem, given the easy focussing mechanism with these lenses, but it does mean that statements of minimum focus distances are approximate. My thanks to Martin Grahl of Novoflex for supplying the image of the German edition, which was available in 4 consecutive issues, in 1961, 1964, 1966 and 1970. Far right: the French edition, "Livre de Poche Novoflex"
For details of other books on Novoflex equipment, see here. 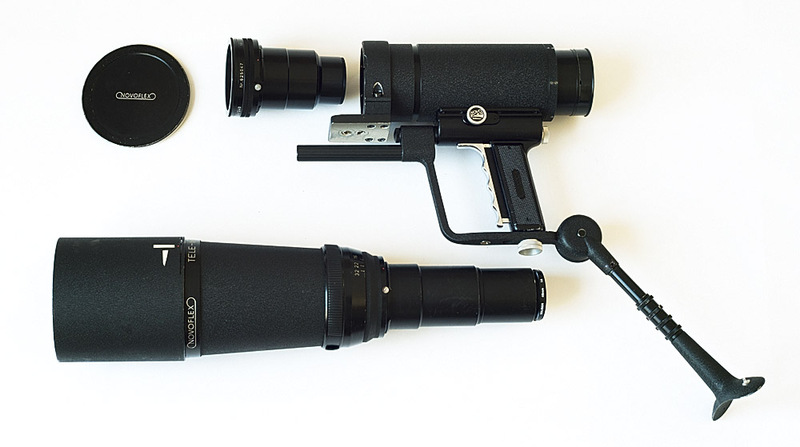 in practice, one is not likely to use this Novoflex lens with the rifle stock - unless one had just made a quick change of lens head when otherwise shooting with the 500mm Tele-Noflexar. A more realistic comparison would be with the 250mm Schneider-Kreuznach Tele-Xenar or the 300mm Carl Zeiss Jena Sonnar. 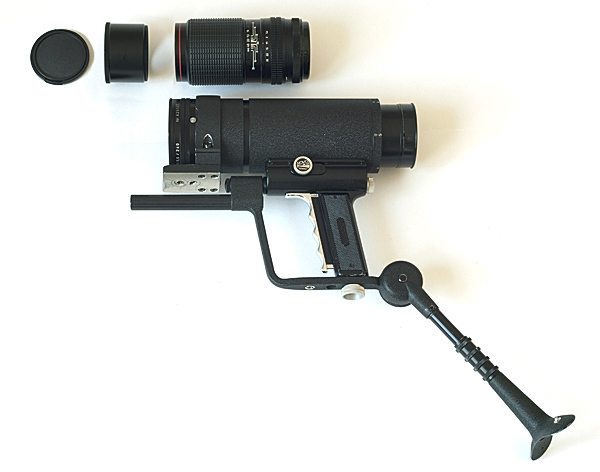 The lens head and pistol grip are shown without the rifle stock, which is unlikely to be used with a 240mm lens on a medium-format camera. It is thus seen to be much more compact. It is possible to see the tripod socket that is in the base of the pistol grip. – a model that definitely will have been of interest to many photographers of the day! 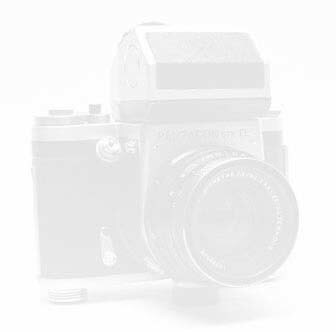 To see this lens with the TISPIGRIFF-U, click here and scroll down. To go on to the next section, the review of the 500mm Tele-Noflexar, click here.